XP Medical carries a selection of booster pads, unisex pad and pants systems, and guards/shields for men. Booster pads are incontinence pads that are meant to be used in conjunction with another absorbent product to increase overall absorbency. 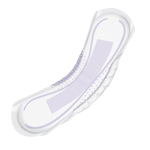 Booster pads have no plastic backing so that moisture will flow through to the outer incontinence product. 2 Piece Pad systems are pads designed to be worn comfortably under conventional underwear or mesh pants. Guards and shields for men are urinary incontinence pads anatomically designed for men.